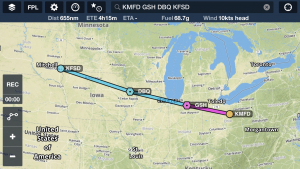 First Leg from Indianapolis, IN to Mansfield, OH: It is Sunday morning, 8/26, at around 8:15 am when we get to the airplane. The Captain for this mission, we’ll call him George to maintain a semblance of privacy for the flight, busies himself with getting ice and paying the bills. We walk out to the airplane; he opens the door and gets in. We are going, apparently. Now. I tell him to get settled and I’ll do a walk-around of the airplane. I’m looking for any sign of damage or obvious oversights since he’d last seen the airplane. We are taking two passengers from KIND to meet six more out in Ohio. I am the last one in and ask him firmly to watch me close the door to ensure that I am doing it properly. I’ve seen the videos a dozen times, but never actually closed a door until now. I want to ensure I can do that properly, and that I know what to look for. I get into the right seat and both engines are already running. 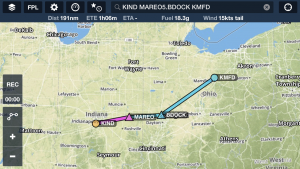 My job is easy, and we are soon airborne and heading northeast to Mansfield, Ohio. George has been here many times before, and taxis up to what looks like a hangar to me. Apparently it functions as an FBO, but it seriously is set up in a hangar. No fuel required, and none in sight. We find a gaggle of folks hanging around with boxes and gym bags, ready to go. It takes me a minute to open the door, and I do so without lowering the fold-away step. I’ve had maybe 3 flights in this airplane so far. No one has used that step even once, so it simply doesn’t occur to me. The oversight earns me a look of derision from one of the large male passengers. He has done this before and knows where the step is. He becomes the gentlemen for the ladies, and proceeds to help them up the step. None of these folks are small. I am not scoring any points with them, and remind myself that exaggerated customer service might be warranted here. I’m looking clumsy outside watching to see what everyone is doing, but I figure it out soon enough and get engaged. I start grabbing passengers bags and walking them back to the storage compartment on the left rear of the airplane. Most of these bags are large and heavy, so it will be a learning experience getting them all in the luggage area. Passengers are boarding now, and the big guy (my step helper) re-emerges from the airplane with a printer box in his hand. Clearly I have forgotten this too, and he’ll help me store it in the back. George had actually pre-loaded the printer on the 8th seat – the potty seat. With 8 people aboard, this box will add to the cramped conditions, which made my large friend think it was a mistake. I thanked him, and then turned him around with the box in his hand. First – there is no room for this with all the luggage you guys brought with you, and second, the owner wanted that box go back inside the cabin so it won’t be exposed to the cold in the storage area. You work for him, what would you like to do? He took it back inside. Later this same guy rewarded us by taking a dump in the LAV. I’m not sure exactly how he managed that with 8 people aboard this relatively small jet, and I try not to think about it. The airplane was absolutely full. I get back in the airplane and fumble a little turning around to secure the door. This is the first time that I have closed the door without someone qualified looking over my shoulder. I was paranoid, careful, and clumsy. The big helpful passenger was watching and waiting to jump I there. I give him a gentle stay seated, I got this look. The door stayed closed for the entire flight, to I did it correctly. George was too busy starting engines to be concerned with the door. There are no lightweights or shortage of baggage onboard today, so I go forward with interest to see the weight numbers and calculate our V-Speeds. The engines are already turning and George is trying to taxi. I guess we’ll review weights and V-speeds later. The airplane strains but doesn’t move. That is because the chocks are still in. I guess that is my bad, though there are three line people milling about outside. George signals one of them to remove chocks, and we start our taxi. I do the taxi checklist quietly on my own. George has his phone in his right hand, steering tiller in his left, and we are taxiing between hangars. He is trying to send a text to his boss, who wants to know how things are going each step of the way. I frown inwardly but resist saying anything. It is clear to me we are going right to the runway, so I estimate my own speeds at 120/130/186 and note them (no speed bugs). I will call them during the takeoff sequence. Not the way I’m used to planning and doing things, but I’m going along for now to see how a typical 91 operation makes it work. We pause at the hold short line to check for traffic and then take the runway for takeoff. No time to pull out the paper checklist, so I do lineup checks from memory. Off we go! Second Leg: Our next stop will be for fuel, so at least George has thought about the loading ahead of time. Not everyone computes a weight and balance like we do in class. If you aren’t going to do something each leg, I recommend doing have a few prepared scenarios available (in the back of your AFM, for example), so you can pull them out on a ramp check. It’d be nice to be able to point to what you based your decision on, and to show that you’d considered performance before you took off. It would be nice to ensure your co-pilot is on the same page as you too. Climbing out of Mansfield, I’m looking around and running checklists to see what might have been missed on the departure. I find a number of things and use the checklists to get them caught up. The third leg: was out to the west coast. I’m not documenting where we went because this particular private jet owner is a competitive business man and doesn’t want his whereabouts tracked. I signed an agreement not to disclose his movements, or anything else I observe, and I am honoring that. 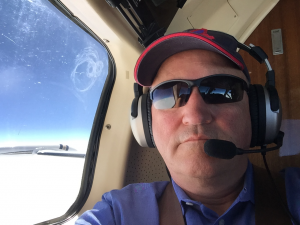 As we taxied out for takeoff, George was jerking the airplane left and right of the centerline with his left hand while texting furiously on his phone with the left. His head was down consistently, and he’d not understood our taxi clearance. He’d done this twice before and I’d looked the other way, trying to observe and ease myself into his process. George is always rushing, and twice took off before I or the jet were ready. You can make these kind of shortcuts and mistakes thousands of times without getting hurt, but that one time when all the stars align and Murphy shows up…….. It was time to assert myself. I’d been watching this behavior since the first during the first two legs. George would be writing texts while taxiing to the point that the airplane was jerking left and right. He generally knew where he was going by sheer repetition, but the airports were unfamiliar to me. Some of these texts were written on the runway lining up. I’d had enough. On this third leg, when George misunderstood our taxi clearance for the second time, I asked him to stop the airplane for a moment. He did, but immediately try to compensate by giving me a flood of things to do. I acknowledged his requests and explained that my job at the moment was to monitor him to ensure that the taxi process was safe and successful. Quite honestly, we weren’t doing a very good job of that at the moment, so everything else will have to wait. I told him I did not want to see his phone is his hand while the jet was moving, and that wasn’t a request. There will be no more using the phone while he was taxiing. Don’t do it. Right now we were taxiing, and not doing a great job of it. Let’s get where we were going, and then get the airplane ready for takeoff. He put the phone down and taxied the jet while I updated him on our clearance and got us both on the same page. We are moving again, so I went continued ‘We’d taken off twice today and missed important items both times. That is because you have been rushing for some reason that is not evident to me’. I further asserted that we’d no longer be accepting takeoff clearances unless BOTH OF US agreed. If I’m not ready and haven’t run the appropriate checks – you’ll know because my feet will be on the brakes. I truly believe that he appreciated what I’d been saying and I managed to say it in a firm but believable way. He didn’t react with hurt pride, but appreciation. I think this guy is financially stressed and has allot going on in his life. He just needed to be reminded and we moved on quickly. The takeoff went smoothly, but we still missed a few things. I’ll take responsibility for those this time; admitted what I’d missed to him and promised we’d get a better flow together as the trip continued. Our flight out to the coast was uneventful and the weather clear as we cruised up in the 30’s. The was the highest altitude I’d flown an airplane so far. The fourth leg: would be the last leg of the day, flying back from the west coast to Canada. We filled the tanks and flew east with no passengers – repositioning the jet for the next day. Here George took an action with the fuel system automation that was acceptable, but one that I didn’t recommend. Once we leveled in cruise, we had plenty of time so I thought it would be good to talk about my point of view on the topic. I explained that I preferred not to use an automatic fuel transfer of fuel based on quantity remaining due to the fact that a valve failure wasn’t as evident since you weren’t looking at it when it happened. I preferred to do it manually. What he’d done was absolutely acceptable and as designed, but there was also another gotcha that could happen when refueling. It was a good technical discussion that killed some time, but then George decided to agree with me and selected the valves to OPEN rather than AUTO. We were doing fine up to that point, but opening the valves while we were full of fuel would actually be forcing fuel overboard through the vent system. He had forgotten that, and I came right behind him and closed the valves. It was a learning moment for him, and I asserted that his original process was correct, and the CLOSED position would rely on him remembering to move the valves when we were down to 6000# fuel remaining. His original selection of AUTO would initiate the transfer automatically at 6600#, which was fine but not my preference. The only position you could not be in while loaded with fuel is the OPEN position. Class dismissed and we flew along quietly for a little bit. Landing in Canada was a night with scattered low clouds. No approach or pre-landing briefing called for or desired, so I briefed myself and then verbally confirmed the basics with George. We left the jet hurriedly, and had a long drive to our hotel in Hanover. Per the schedule, we’d have about 6 hours of sleep before flying to Ohio and back to the west coast again. August 27 – Heading West: The hotel was clean and nice. I had no trouble falling asleep after a very long day. Arriving at the jet, George climbed right in and got ready to fire up. I walked around and did the best cursory pre-flight I could do under the circumstances. 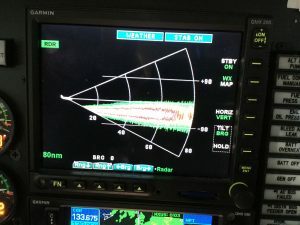 There was quite a bit of weather on the way west, so I was able to play with the radar a bit. 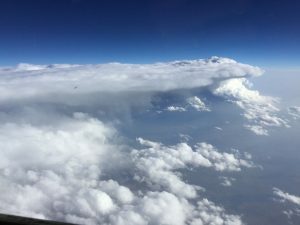 We were flying above all of it at 36,000′, and deviating around anything that reached up to us. The colors didn’t come out great, but you can see from the insert that I was able to us a profile view to get a feel for how thick the clouds were. Skimming along the top, we’d be fine as long as we didn’t lose an engine. Had that occurred, there were times when we’d have been forced to drift down on the remaining engine – right into the bad weather. That would be a double whammy that George and I kept an eye on. After landing on the west coast again, I had a 10 hour wait for my flight home. Before I left, I talked with George about not giving me any flying time, and he apologized. He hadn’t thought about it and said that the next time he’d have no problem putting me in the left seat if I’d wanted. While I eventually do want to PIC these flights, that will have to wait until I build sufficient right seat time actually flying the airplane. Next time I’ll ask to swap legs but stay in the right seat while doing it. I read another novel and had a nice lunch waiting and waiting. Thanks for reading all this. I’m scheduled for my second contract flight tomorrow (10/14) and the write-up will be short. This flight will be much shorter in length and flight time.